As we go forward on this certificate of title issue, it is very important that everyone understands it. What was printed in the U Matuna on November 29, 2015, was not only a false public record, but a thorough justification of its publication by this archdiocese' own Vicar General - the church's equivalent of an Attorney General. Imagine the Attorney General of Guam, using the official communication organ of the Superior Court, to publish a false public document, justifying her personal ownership of a particular property. Would you be upset? Would you be outraged? Would you be calling for an investigation? Of course you would. Well, this is exactly what your Archdiocesan leadership did to you on November 29, 2015. The only problem is a Vicar General is not elected nor can an investigation be conducted via the normal channels of available to us as citizens (Sunshine Act requests, etc.). However, with the publication of a false public record, the leadership of the Archdiocese of Agana has breached their previously impregnable "wall of separation between church and state." 9 GCA § 55.10 defines what qualifies as "tampering with public records" is, and outlines how said tampering is "defined and punished." However, before we can proceed along legal lines, most of us need more education about what actually happened. And so I will present a few more posts in this series to that end. The following article is approved by Monsignor David C. Quitugua, Vicar General of the Archdiocese of Agana. As mentioned in a previous post, most of us only engage in one real estate transaction our entire lives: the purchase of a home. And for that reason, most of us are unaware of the intricacies surrounding ownership and control of real property. In fact, when I bought my home twenty years ago, I did what most buyers do: sat down and signed paper after paper, not having a clue as to what it was all about, but trusting the real estate people, the bank people, the escrow people, etc. The only thing I understood was the amount of my upfront costs and my monthly mortgage and that I would be able to move in on a certain day. The other day I was looking through my mortgage documents and came across a copy of the certificate of title for my home. It occurred to me that I could deed the property to one of my kids and then go find some fool who would buy the property based on what my copy of the certificate of title said. Finding said fool and milking him for several hundred thousand dollars, I would take the money and run while said fool shows up to move in to what he thinks is his house and finds my son already living there with a copy of a deed proving his ownership, a copy which was never memorialized on the certificate of title. This is what your Archdiocesan leadership did to you, except it is worse. The certificate of title for my home is dated 1994, and I - per the story - deeded the property to my son in 2016. Of course the 2016 deed would not show up on the 1994 certificate. In the case of Apuron, David, Adrian, et. al., they procured a copy of the certificate of title which LEFT OFF an instrument impacting the title which was recorded four years EARLIER! Also! 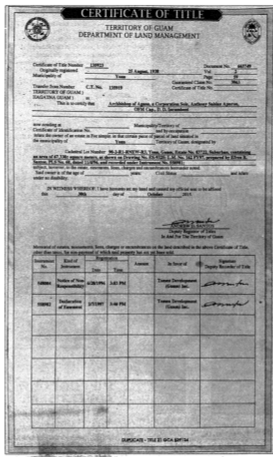 EVEN if the Declaration of Deed Restriction did not deed, convey, transfer, and grant title to RMS (which it did), the very fact that it restricts the use of the property, and especially because it restricts it forever (perpetual use), Guam law requires this instrument to be recorded on absolutely every copy of the certificate of title for the subject property(ies). So let's review with a little different story to better illustrate what Apuron, David, Adrian et. al. did to you in the "Catholic" newspaper on November 29, 2015. I record a legal instrument at Land Management restricting the use of the property for the perpetual use of my son. My son continues to let me live there, because after all I still own the property. You want to buy my home. You go to the Department of Land Management and order a copy of the certificate of title for "my" property. The Registrar of Titles gives you a copy of the certificate WITHOUT the memorial showing the property restricted for perpetual use by my son. You are a cash buyer so need to use a bank, in fact, you just want this to be between us so we don't even go through escrow (two entities which would have caught the restriction). I hand you a warranty deed. You hand me $300,000 cash. I agree to vacate the home in 30 days. You record the deed at Land Management. The property is yours, right? Thirty days later you show up at your newly purchased house with your pickup full of stuff, ready to move in, but wait! My son is living there? My son says WTH back! You show him your document and he shows you his. His document says he can stay there forever no matter who is the owner. Guess what? You are SOL! And on November 29, 2015, that is exactly what Apuron, David, Adrian , et. al. said about us (SOL) when they published that false certificate of title. BUT - Little did they know! Here is Part 1, Part 2, Part 3, Part 4, and Part 5 of this investigative story. Thank you for your contributions to keep documentation and stories like this coming. So it sounds like once again tony and his band of thieves thought they could pull the wool over our eyes. Once again, tony and his band of thieves figured it would be easier to lie to us than to just tell us the truth. Once again, tony and his band of thieves tried to falsify documents and mislead the public. It is obvious to the average person on Guam that tony is making this huge effort to cover up actions that he took in 2011. To go through all this deceit and moral corruption is quite amazing. It is a huge sign that tony himself knows he committed a grave error, and criminal act against Canon Law. By hiding it from the people of Guam, he hopes he can hide it from Rome as well. Will the Church allow this to continue? And if he is being blackmailed as some have mentioned, then it goes to show how terrible a deed he must have committed and the extent that he would go to keep it from the light of day. News flash... the rumors are out there already. Yes, the Church will allow this to continue, Janet. The Vatican has always been concerned about "bella figura," how it will look publicly, yet the leadership does not even realize that by ignoring the unbearable problems in Guam they have allowed mud to be thrown at them as well. The Archdiocese is independent but any infraction by the one they have chosen to lead (in this case, the total absence of integrity and respect for Apuron) also points to their irresponsibility and mismanagement. Yes, the Vatican has a lot to clean up worldwide but with the Jungle Watch readership in all corners of the globe, the glaring lack of decisive leadership to discipline Apuron sends a very wrong message: the exact opposite of bella figura! Looking forward to the part 8 as we watch the Dungbat fall on her flat on the web of lies she contininues to weave. Even when he was off-island, he still tended to his flock by taking the time to provide those documents otherwise you would not even have a document. The fact that you were provided documents from the Archdiocese showed his effort in trying to bring about unity.